Mother Panic/Batman Special #1 review: Milk Wars continues! – AiPT! Mother Panic/Batman Special #1 review: Milk Wars continues! Mother Panic/Batman introduces Father Bruce to the Trinity of Milk! Mother Panic/Batman is the second issue of the Young Animal/DC crossover, Milk Wars. This issue deals with Father Bruce, who is the homogenized version of Batman. With some good writing by Jody Houser and great artwork by Ty Templeton, it’s a solid second part to Milk Wars. Gives a very Adam West vibe. Mother Panic starts off by letting new readers know some basic information that they need to know for both the character and the situation of the issue. This was super helpful personally, as I had no clue about the character before this issue. It summarizes the character well and gives the reader backstory needed for the issue without being too much. Father Batman is a very interesting take on Batman. Take the man who is committed to justice and change it to a commitment to God. Then take his act of turning child orphans into vigilante sidekicks and instead have him make them a small mob of armed orphans who live in his religious orphanage. Seeing small children dressed as Robin and holding guns is a sight I had not expected to see but is an interesting one nonetheless. 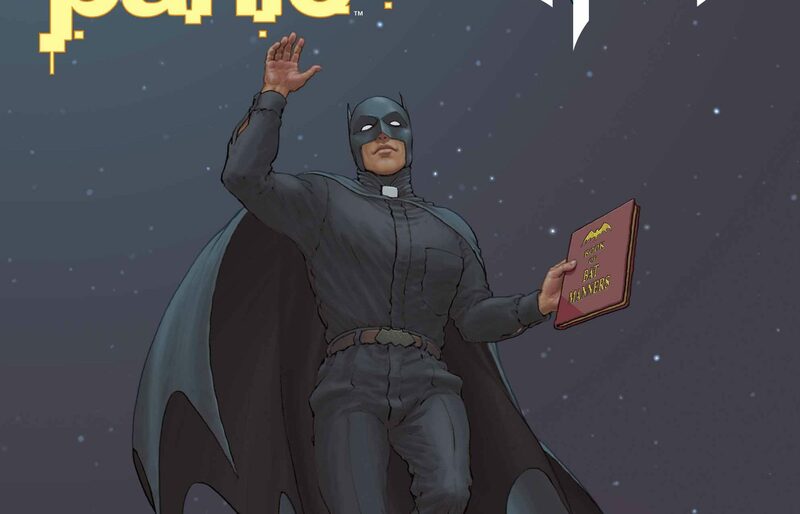 Father Bruce is such an absurdist concept that it’s hilarious, right down to how Bruce was sitting in his study when an old man burst through his window to give him milk and turn Batman into the priest that is present in the issue. The machine that turns the orphans into Robins is great and drawn in a very Kirby/Allred style, which matches the craziness of what is happening. The “war against Christmas” comment is both a funny jab at modern day issues while also being a completely stupid thing for the children to chant. The whole puns and jokes by Father Bruce and the children about milk ties in with the event’s theme while also being a very Silver Age-style thing to say as well as the nun at the house being literally a creation of milk. It’s all absurdist and Morrisonesque but also so good at the same time! The art style fits the issue well as it brings a very Allred/Kirby vibe to it while fitting the story and character well. Definitely one of the better artists at DC currently. Overall, Mother Panic/Batman Special is absolutely absurd, and I wouldn’t have it any other way. A fun, absurd story that continues the strangeness of Milk Wars. The artwork by Ty Templeton is a great fit and looks amazing. The writing for the issue by Jody Houser is great and fun. Father Bruce and the Holy Sidekick Choir of Merciful Justice were hilarious.